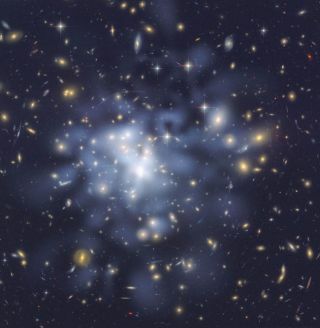 This NASA Hubble Space Telescope image shows the distribution of dark matter in the center of the giant galaxy cluster Abell 1689, containing about 1,000 galaxies and trillions of stars. Astronomers from across the U.S. are heading to Texas this week for the 229th meeting of the American Astronomical Society (AAS). The biannual meeting, which features new developments in astronomy, astrophysics and planetary science, is often called the "Super Bowl of astronomy." The event will feature more than 1,600 lectures, short speeches and poster presentations that will highlight the latest research and discoveries, from the solar system to the farthest reaches of the universe. At least 2,400 scientists, students, teachers and journalists will attend, including two Space.com reporters, who will bring you the latest news from the conference right here at Space.com. Attendees will explore a wide variety of space subjects, such as the hunt for exoplanets and the elusive "Planet Nine"; the formation and evolution of stars and galaxies; the nature of black holes, dark matter and dark energy; solutions to light pollution; the influence U.S. politics will have on astronomy; and astronomers' roles in fighting climate change. For aspiring astronomers, the meeting will host workshops for analyzing astronomical data as well as career planning. These are but a few examples of the vast number of astronomy findings that will be presented at this winter meeting of AAS. Throughout the week, Space.com reporters Calla Cofield (@CallaCofield) and Sarah Lewin (@SarahExplains) will report the news and discussions from the meeting.